1. 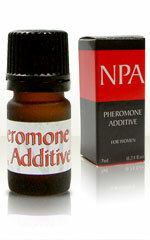 Salesmen figured out that pheromones helped their contact with female clients. Older people seem to enjoy the effect and minor behavioral changes towards the salesmen were noticable. 2. Pheromones easily influence where males and females take a seat. While women find themselves attracted to chairs sprayed with pheromones men tend to avoid them. Allegedly furniture companies used pheromones in exhibition rooms to direct the customers' attention to hard-to-sell products. Males use pheromones to gain respect and appear to be more dominant and intimidating. 3. Independent scientists proved that women chose chairs ten times as often as other chairs if they had been sprayed with pheromnes. It seems that women find themselves subconsciously attracted to the respective chairs and view them as some sort of sanctuary. 4. This experiement has been successfully repeated with telephone booths. It was shown that women used sprayed booths more often and that the duration of their usage was increased, too. In both experiments males behaved quite opposite to the female behavior. They avoided sprayed chairs and telephone booths. It is suspected that males tend to avoid territory that has already been marked by a supposedly more dominant male. 5. One experiment made the experimentees believe that the aim of the experiment was to figure out if the stress caused by wearing a facial mask would have an effect on decisions made. While they were wearing masks they were shown photographs of males and females, animals, trees and buildings along with the request to judge them in terms of attractiveness, aggressiveness, friendliness etc. Each person was tested a second time after a fortnight. No one was told that minimal amounts of pheromones had been applied to their facial masks during one of the sessions. They were shown exactly the same photographs in both sessions and their decisions altered under the influence of androstenol. Their judgement of buildings and trees remained fairly unchanged. Animals were perceived to be more rash and harder to estimate. The differences in judgment of people were most remarkable. Males and females alike were judged to be more sensitive, better, more intelligent, sexually more attractive, warmer, friendlier and more trustworthy. 6. The use of pheromones for debt-collectors (they sprayed reminders with pheromones) has been patented. Reminders have naturally an intimidating effect. Sprayed letters were paid more often and a little faster. On a subconscious level a sprayed letter communicated that the sender was dominant, aggressive and determined. The equivalent of a smell to red ink.